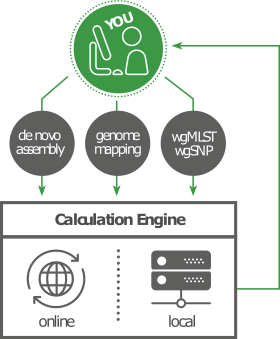 Demanding calculations on whole-genome sequencing (WGS) data can be performed on an external Calculation Engine which is completely integrated with the BioNumerics client software. From within the BioNumerics software, you can post jobs on the Calculation Engine and easily retrieve the results. This keeps your computer responsive and your database lightweight, so you can focus on the actual analysis. It also means that hardware requirements for your desktop or laptop computer running BioNumerics are kept modest and that you can let the Calculation Engine do all the heavy lifting! What is the Calculation Engine? The Calculation Engine is a server application that provides easy access from the BioNumerics desktop client application to a high-performance computing (HPC) environment for doing calculation-intensive tasks, including de novo assembly, reference mapping and whole genome multi-locus sequence typing (wgMLST) allele calling. A nomenclature service is integrated with the Calculation Engine for wgMLST. The Calculation Engine is installed on a powerful computer cluster, either locally or in the cloud. All communication between the BioNumerics client and the Calculation Engine service is handled by the WGS tools plugin, which is already included in your BioNumerics installation. Authentication is done through a project name and password, linked to your BioNumerics license. enables import of sequence read sets as links from the NCBI Sequence Read Archive (SRA), EMBL-EBI European Nucleotide Archive (ENA), Amazon S3 buckets, Illumina BaseSpace or local file servers. In short, simply installing the WGS tools plugin and entering your credentials to a project unlocks the full power of the Calculation Engine! The default Calculation Engine instance in the WGS tools plugin is the Applied Maths cloud Calculation Engine, which is hosted on Amazon servers and accessible worldwide. It is designed to process hundreds of isolates within the hour, providing extremely fast turnaround times for the primary analysis in wgMLST and wgSNP. 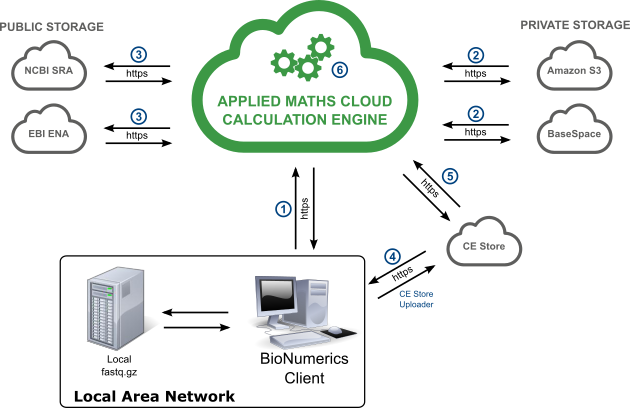 Leveraging the Applied Maths cloud Calculation Engine for your research requires no investment in computer hardware and is almost setup-free. The only thing you need is a Calculation Engine project, which can be requested online. Credits for the Applied Maths cloud Calculation Engine can be ordered via our online credits order form. If you like to try out the Calculation Engine for your research, simply request a BioNumerics evaluation license and mention which organism you are working on. No metadata is ever sent to the Calculation Engine. We always use secure connections (HTTPS) when private data are transmitted. All exposed services use strong passwords and encryption algorithms. For more details, check out our Knowledge Base article on what information is sent to the Calculation Engine. The user launches a job to the Calculation Engine. If the sequence reads are stored locally, a separate executable (CEStore Uploader) is started and uploads fastq.gz files to the CE Store (4). No metadata are stored on the CE Store, private storage or public storage! Via the sequence read set link, the Calculation Engine fetches the sequence reads from CE Store (5), private storage (2) or public storage (3). The HPC cluster on the Calculation Engine executes the job and makes the results available for the BioNumerics client. The user downloads the results for the submitted job. The CE Store is Amazon S3 storage managed by the Calculation Engine. This means that only the Calculation Engine can read data from the CE Store and obsolete files are deleted when their caching time is expired. With large sample volumes, it can be beneficial to have a local installation of the Calculation Engine, either on your institute’s own computer cluster or as a private cloud solution. Several influential public health institutes and major industrial customers already have their own installation of the Calculation Engine. For local Calculation Engine deployments, we provide installation either on-site or remotely. The calculation engine installation, maintenance and updates are defined in customized service contracts. Local Calculation Engine deployments can also provide an outcome for institutes facing strict local or national data protection laws, excluding the use of any public or private cloud services. With a Calculation Engine installed on a local computer cluster, your data effectively does not leave the premises! Contact us for more information and a price quotation.